It feels strange to introduce Chris since he is talked about on this blog all the time. But just in case you are new to this blog, let me introduce you to my man, my pumpky, my husband, Chris. Some things I love most about Chris are (in no particular order): you would never guess it but he loves to dance (every morning there is a dance party in our house), he is the most genuine man I know (truly you have never met a man that is more themselves than him), he is the best daddy (seriously, I have never seen someone be such a natural at this role), he never compares himself to others (could care less if I say, "but ____ are doing / have ______. "), he wakes up early every morning and spends time with the Lord (yes, from time to time, he misses, but this is rare, very rare), he works hard (I love that he never does the bare minimum at his job and I also love that he doesn't play the corporate game, he just believes in hard work), he fights hard for our marriage (he is intentional at loving me and is constantly looking for ways to fight for our marriage), and he really supports me (I'm sure most people struggle to see their gifts like I do, Chris points them out to me constantly). I love Chris. I respect Chris. And, even after living with him for the past 4 years, I really really like him. He is my very best friend. And I am so thankful that Karis has him as a Daddy. As you grow older by the day, I wanted to put in writing a few of the things I hope and pray over you constantly. Life is full of lessons, heartache, pain and extreme joy. It’s my hope as your Dad that you would experience all of these things as you choose to experience the journey God has ordained for you to take. First, Jesus Christ is the most fascinating, loving and challenging person I think you could ever know. He’s God’s Son. He came to Earth over 2000 years ago to experience everything we could experience, to teach truth in the face of evil, to take on the weight and punishment of our sin and to rise 3 days later from the dead to prove his authority over Satan’s greatest weapon. He ascended to Heaven and now sits on a throne, interceding (fancy word for praying) on our behalf throughout our days, orchestrating everyday life and appointing leaders in our culture. His death paid the price for our sin, so if we accept Him as our Savior and truly believe He is the Son of God we can then spend eternity in Heaven with him. There’s another piece I think is important though too. We can also live the rest of our lives with Him. We can lean on Him in order to experience freedom, pour over His words in the Bible to gain wisdom that will help us deal with different circumstances and really, truly know Him as the fierce protector, Father, friend and Savior that He really is. I couldn’t begin to ask you to understand where I’m coming from, as your Dad, without understanding where all my strength, wisdom and model of a Father is coming from. It’s my hope you would experience Jesus Christ fully during your life and it’s my role to be a reflection of his love and grace towards you so that I can someday lead you into a relationship with Him. My first instinct towards you has always been protector. As you were growing in your Mama’s stomach, from day 1 I hoped you were a girl. 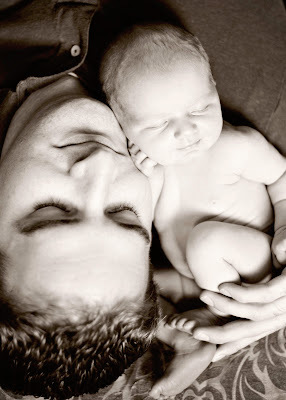 I wanted the role of protector and the chance to pour my life into my little girl. When you were born, your Mom wouldn’t let me leave your side as you traveled to different offices and eventually into the NICU. I think it was her clever, subtle way of telling me, “Protect her Chris, she’s yours now and God has answered your prayer.” When I held you, I held you like fine glass, wrapping my arms around you so completely that it would be impossible for you to get out. When we finally took you home, I refused to take the interstate and drove probably 20 miles under the speed limit just to be safe. I woke up for at least the first 30 days of your life in bed frantically searching for you in the sheets because I thought I was smothering you or that you were about to fall off the bed (thankfully they were all bad dreams). When we walked around the Arboretum and a squirrel surprised us from the side, my first instinct was to hold you close. I check our video monitor multiple times before we go to sleep and sometimes walk into your room, put my hand on your back or front just to feel you breathing. I don’t care if I wake you up; I care that you’re safe. It’s my privilege to make sure you’re taken care of, no matter how silly I look or how many sacrifices I have to make. Second instinct was love. Watching you sleep 18 hours a day was how I fell in love with you. You offered me nothing as far as conversation, acts of service, wealth, or entertainment (well maybe that). I want you to know I fell in love with you because you were my daughter. I fell in love with you because you were a person that God created and gave me the privilege of raising (along with your Mom). You could never do anything that would make me love you more or less because my love for you is unconditional. I won’t tell you what it means. I’ll show you over the course of your life, trust me. Along with that, I want you to know that you’re valuable. The impact that women can have on a family or even this world is rarely celebrated like it should be in our culture. You’re going to have to learn that our culture isn’t the well spring of truth like they claim to be. You need to drown out unnecessary noise, especially when it comes to the things that make you truly valuable. They’ll try to tell you that you need a man, have to look a certain way, be a certain size, manipulate those around you to get what you want and have a career in addition to being a Mom. The most important thing is this… God created you with a purpose and intends to use that purpose to help you realize your full worth and value. Mom and I will help you discover that purpose, but God’s design for your life is so much more interesting and deep than anything we could ever want for you. Lean into Him and learn to trust Him so you don’t have your purpose clouded by your ever-changing emotions. Emotions… I’ll be as understanding as I can be but this isn’t my strong suit. I know how to hold you regardless if you’re kicking, screaming or sad so I’ll offer you a warm body. Your Mom is probably better equipped to handle this part of your life, but I promise to try. Your Mom… Karis, I did well when I picked your Mom. I don’t brag about a lot of things I’ve done, but this is one of them I have no second guesses about. Your Mom is someone who loves life, refuses to be bound by expectations or culture, passionately pursues Jesus regardless of obstacles and uses the gifts that God has placed inside of her for the benefit of God’s kingdom and the people around her. She’s not a selfish person and often sacrifices her feelings or preferences in exchange for truth. She’s a good friend to people, a true friend that wants to know who you are and how she can help you be more of that person. She doesn’t dwell in the past and isn’t afraid of change as long as it means she’s getting closer to her purpose in life. She’s a great friend to me, encourages me daily and lovingly pushes me to be a godly man and a godly husband. There is nobody I want you to follow closer than your Mama. I hope you’ll see this through videos someday, but there are so many times she’s making a squawking noise to get you to laugh, creating activities that you two can do together and wanting to go outside so you catch the love for nature that she has. She loves being your Mom, loves putting you in the most ridiculous bows and cutest outfits and feels so proud when teachers or friends tell her how sweet you are. I hope you learn to trust her completely. Your Mom has the gift of discernment. She may challenge you in some areas that are uncomfortable or know something about a boyfriend of yours that you wish she couldn’t see. I pray that you would trust her and listen to her wisdom. The reason I trust her the way I do is simple… the time that you won’t see in videos. She’s up every morning, a Bible and journal in her lap actively living her life to glorify God and find strength in Him for the coming day. She’s committed Karis, to you and me, and someone who is worth listening to. Last, and least, is boys. Whatever boys you are attracted to, I hope that you’ll be attracted to their character first. Looks are important but character is non-negotiable. I would challenge you to expand this attraction to more than looks. Really seek to enjoy this person, explore what makes them tick and what makes them go. If you can fall in love with just about every aspect of a person, you’ll have more things to encourage in him and enjoy throughout your marriage. Guarding your heart is vital to walking through the land mines of dating. From what I’ve written above, I hope you trust that the men in your life (Jesus, myself, grandparents, uncles, friends) really do want the best for you. A junior high or high school boy isn’t always thinking this way. Commit to protect the gift of your purity and rely on Jesus to give you strength when that seems impossible. Accept the hormones God has given you but again, find the purpose of them. This gift to your husband will mean the world. To close, these are the prayers I pray over you nearly every night as I rock you. Father, let our home be an environment she feels safe in and one where she feels the freedom to completely be herself. Show me her gifts and help me steward those and refine those in her as her Dad. I pray she would be filled with integrity and not a gossip. I pray for godly mentors in her life; wise women who will pour into her. Help her to do the same with those coming behind her. I pray she would follow her Mom closer than any other woman. I trust you've placed her in our family specifically, so I pray for strong relationships with both Mom and me. I pray she would have an insatiable (i.e. she'll never be satisfied with knowing enough) desire for your Word. I pray she would be disciplined in chasing things of purpose. I pray you would protect her physically and emotionally. I pray for a Godly husband that loves You more than he loves her. I pray he would know how to love her so completely that she feels safe in his presence, free to share her opinion and feels heard often. I pray he would know how to date her, how to provide for her and how to lead her heart at all times regardless of circumstance. Help her to be attracted to who he is and who you've created him to eventually become. I pray you would help me let go of her when the timing is right and this man has a name. Now that I'm tearing up I should probably stop :) The last bullet is the first time I've prayed that over you but something that will happen consistently from now on. It's going to take me that long praying to get used to that idea. I love you so completely that I can't imagine my life without you. Every day I walk in the door I get down on the floor and try to get caught up in your world. I ask you about your day, ask you what you did with Mama and what you learned from her and play the silliest games with you to try to get a laugh. I can't wait to be around you and love on you in a way that only a Dad can. After I rock you and put you down and ask for a kiss goodnight, I usually come out and turn on the video monitor to see you for a little bit longer. I then thank God that I have a daughter that I'm so completely in love with, now and forever. Chris Kiser loves (in no particular order): dating his wife (Becky), chasing his daughter (Karis), being a closet dancer, his community at Houston's First, excel spreadsheets, the St. Louis Cardinals, sour patch kids, staying up with political issues (& calling his Texas Representative when needed), becoming a reader, and spending time with extended family. He works as an Team Lead for ExxonMobil in the IT department (but has no power over gas prices). But more than all those things his greatest security, passion and purpose is rooted in Jesus. He pursues a life to know Him more and impact the world with His truth in whatever way, big or small, that may be. (maybe this would get him into posting every so often).